Non-compliant bid excluded SMEs from construction plans. Telstra’s broadband hopes have been shot to pieces following a government decision to exclude it from the National Broadband Network (NBN) tender. The telco was banned from the bidding process after its 13-page non-compliant bid did not meet requirements to include small to medium enterprises (SMEs) in the construction of the NBN. The office of Communications Minister Stephen Conroy confirmed the telco was banned from the bidding process and said the minister will hold a press briefing at 2.30 this afternoon to discuss the issue. Competitive Carriers Coalition (CCC) executive director David Foreman said Telstra should be investigated by the Australian Securities and Investments Commission (ASIC) because it did not lodge its amended SME plan -- which it submitted in secret earlier this month -- to the ASX. “On November 26, the deadline for NBN bids, Telstra chairman Donald McGauchie made a song and dance about how Telstra was refusing to put any more than a 13 page letter into the bidding process, and was holding back on the rest of the bid,” Forman said. “At no stage did Telstra tell the market that it tried to put in more than 13 pages, nor that it had tried to submit an essential component of its bid after the deadline. “If Telstra was trying to have the SME plan accepted after the deadline it must have known that its bid was non-compliant as submitted on November 26. The developments at the weekend show why the government’s process – and Australian citizens – cannot be held hostage to the bullying teams of Telstra lawyers," he said. Industry experts suspect the telco excluded the SME plan from its bid to force the government to bend to its regulatory whims, or cut it from the NBN selection. One insider requesting anonymity told Computerworld Telstra "deliberately left out the SME [plan] so it could whinge about being cut out of the bid on a technicality". Local telecommunications analyst Paul Budde said the government was forced to ban Telstra to maintain the integrity of the NBN process. "[Minister] Conroy just had to say 'enough is enough'. 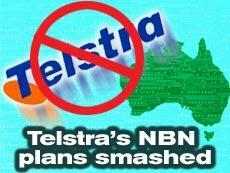 He couldn't take Telstra's bullying and so they were banned from the bid," Budde said. "Telstra could have been banned on a whole list of things. [Telstra's] bid was a deliberate attempt to undermine the process and bully the government." Conroy's office confirmed Telstra's exclusion from the bid was due solely to its failure to submit an SME plan, and not for the 18 percent broadband coverage shortfall between its proposal and the tender objectives. Telstra’s McGauchie said in a written statement the government decision to exclude it from the bid was an excuse to remove what has been an intransigent duelling partner on a range of issues during the tender process. “Telstra provided its SME Plan to the Government in early December and, in Telstra’s view, in accordance with the RFP,” McGauchie said. Telstra was unavailable for comment at the time of publication.